When you set up your SpotCam to connect Wi-Fi following SpotCam setup process, there is a page you can select Wi-Fi in your place that SpotCam should connect, as shown below. No matter you are using mobile, tablet, or web browser, there is this page for you to choose the Wi-Fi network that you want SpotCam to use. 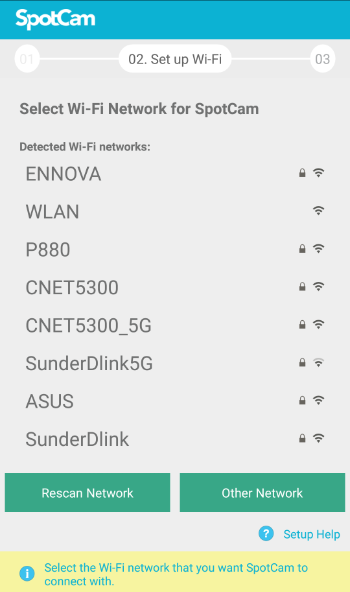 However, it is noteworthy that not all Wi-Fi displayed in the list are eligible Wi-Fi for SpotCam to use. The Wi-Fi list displayed in this page is obtained from the client device you are using (e.g. iPhone, iPad, Laptop, Android device, etc.) instead of SpotCam, which means they may be accessible to your client device but not to SpotCam. Given above reason, we urge you to read this article to know the Wi-Fi requirement for SpotCam connection, and choose the Wi-Fi for SpotCam accordingly to make sure SpotCam can connect to Wi-Fi successfully.